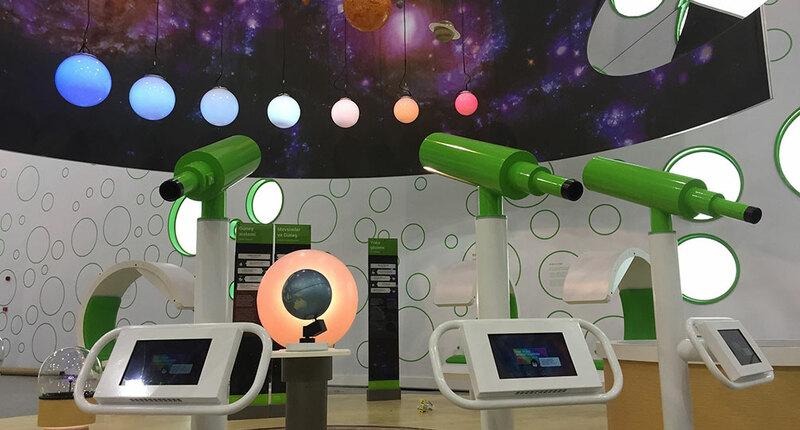 Ideum collaborated closely with Lowell Observatory on a new exhibition for their Visitor Center in Flagstaff, Arizona. 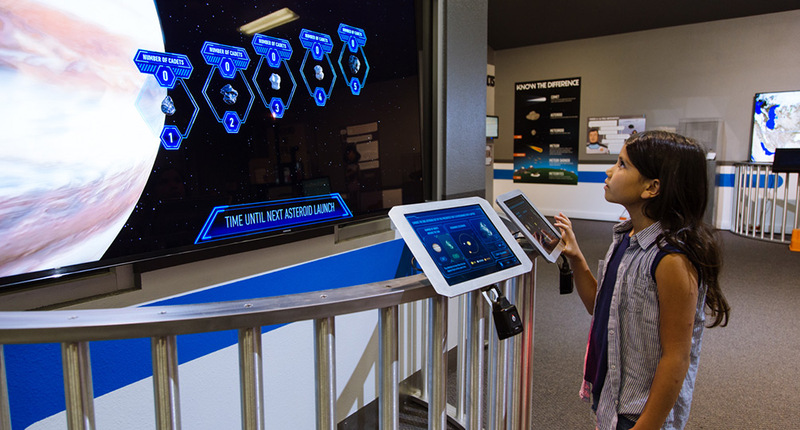 Lowell Observatory approached Ideum with the concept of a gamified exhibition in which visitors would become cadets in a fictional school, the Space Guard Academy, and learn all about asteroids. Ideum had the good fortune to be a partner in the process of conceptualizing, designing, developing, and installing the interactive learning activities. 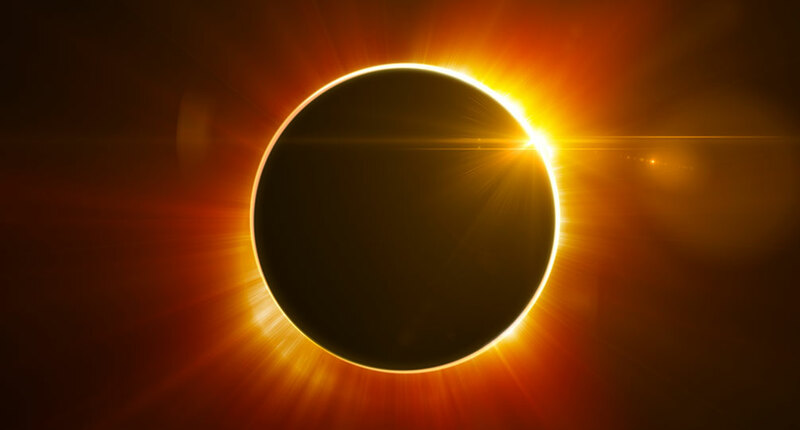 The project challenged the entire team to make complex scientific concepts accessible to a wide audience. In total, Ideum built six interactives as well as a non-interactive "hall of fame" display and a system that tracks visitors as they progress through the activities. As visitors engage with each activity, they earn points which lead to increases in rank and earn badges in specific areas of content. Cadets start out by registering for the Space Guard Academy. Each cadet creates an identity from a list of space-related first and last names, then receives a printed student ID card that they will use throughout the exhibition. By scanning student ID cards experience points, rank, and badges collected can be tracked. The student ID card is not mandatory; non-registered users can also play the activities. However, using the card encourages visitors to participate in all of the activities and perform as best they can in order to increase their score. After registration cadets can flow freely through the exhibition, but the first stop is often the Orbital Resonances of Jupiter activity. Here, cadets use a tablet to explore information about the orbits of a series of asteroids and learn about the concept of orbital resonance. Cadets choose between five asteroids with different orbits and decide which one is in resonance with Jupiter. Every five minutes, there is as asteroid "race" on a 75" wall-mounted display that lets each cadet know if they interpreted the orbital data correctly and chose the "winning" asteroid. Further on, the Asteroid Impacts interactive explores the history of asteroids that have hit the earth. Using interactive timelines on an Ideum 38" reading rail touch screen, cadets can explore the nature of asteroid impacts from billions of years ago to the recent Chelyabinsk meteor. Each time they choose a new impact to examine, on a 75" wall display, a 3D globe animates and spins to the impact location and an image and text about the impact appears. At the conclusion of the activity, cadets must complete a chart to show their understanding of how often different asteroid types hit, and how much damage they cause. In the Photometry interactive, cadets learn to match an asteroid’s size and shape with its light curve. Using a small touch screen, they can spin different asteroids and generate a light curve based on one full rotation. Each 3D asteroid is also displayed on a 75" wall-mounted monitor. The asteroids for this activity were created with painstaking scientific detail by Ideum's 3D artist. After the cadet has explored the light curve data for three different asteroids, they must match asteroids to their light curves. The Astrographs activity simulates a blink comparator, a tool for comparing multiple images of the sky used to identify moving objects such as asteroids. The cadet is presented with a series of 3 images of a starfield that includes a moving asteroid. The screen "blinks" between the 3 images and the cadet must keep an eye out for anything in the image that moves. The final Fact or Fiction quiz checks knowledge about all aspects of the Space Guard Academy, including information from the videos and wall graphics. Cadets must answer 6 multiple choice and true or false questions. After the quiz is completed and the cadet gets their final score, the application snaps a picture of the cadet “in uniform.” A final “Hall of Fame” monitor shows off everyone’s picture, rank, score, and badges. Space Guard Academy opened to the public on May 22, 2016 and will remain open through the winter of 2017.